At the wedding reception everything must be perfectthought out and prepared, starting with an aperitif and ending with dessert. Tasty snacks on wedding table can vary the holiday menu. It is important to take care of hot and cold dishes in advance, discuss the menu with the chef. Pay attention should not only taste banquet dishes, but also take care of their original design, whereby the holiday table will look more appetizing. 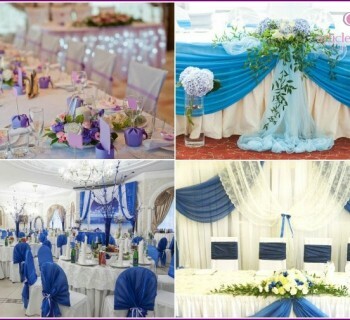 In order to make the wedding tableunique, you need to cook a variety of dishes in terms of taste, which will be remembered and guests after the banquet will be the favorite dishes for many people. Here are recipes for tasty and unusual appetizers, everyone will find something to your taste, and perhaps one of the dishes will be a family signature dish of a young family. Vegetable snacks (salads, fresh vegetables in season - tomatoes, cucumbers, bell peppers). Cold cuts - neck, salmon, ham. Assorted fish - sturgeon, salmon, salmon. 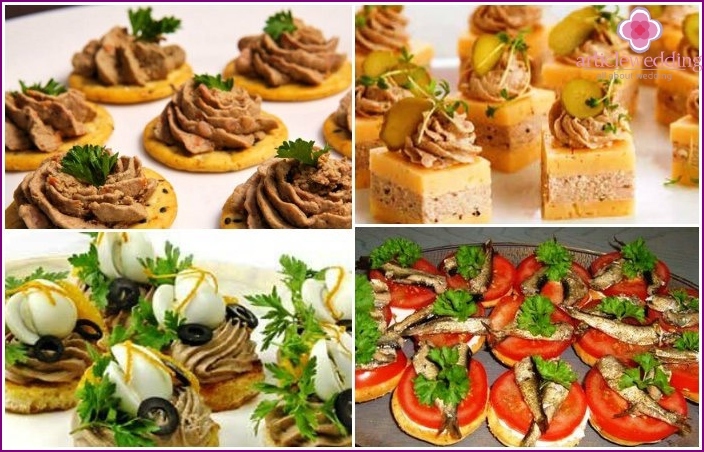 A worthy replacement for the usual sandwiches with spratsat the wedding table will sprat canapé, which are not only delicious, but also look appetizing, original. Such canapés, even with a small number of ingredients and a very simple preparation technique, certainly like many of the guests at the wedding banquet. What does it take to cook unusual sandwiches? Using a blender, you must grind the cheese, softened butter, sprats. As a result, should get a homogeneous mass. Hard cheese cut into squares in a couple of millimeters thick. 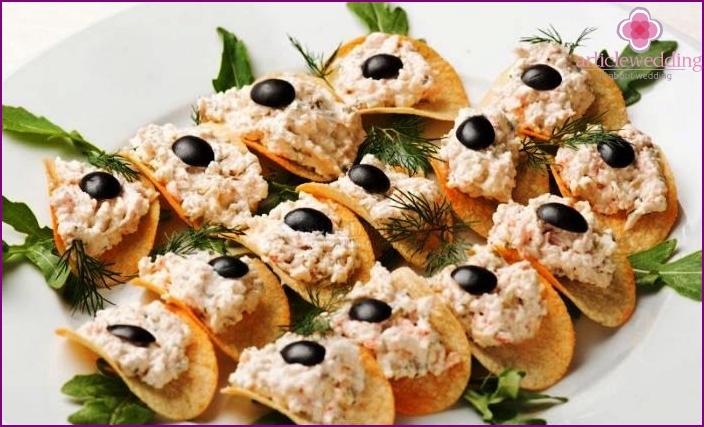 To create canapes need two slices of cheese: one piece is put cottage cheese and sprat weight, and the second piece of it is covered. It turns out a kind of "cake", where the "cream" serves a mixture of curd and sprat, and the role of "cakes" performed cheese slices. Making canapés, you should try to make the edges smooth and beautiful, and the layer has the same thickness as cheese. The top of canapés should decorate a slice of lemon, gherkin. Seafood lovers will appreciatestuffed squid, because this dish is not only the original design, beautiful and appetizing feed views, but also exquisite delicate taste. 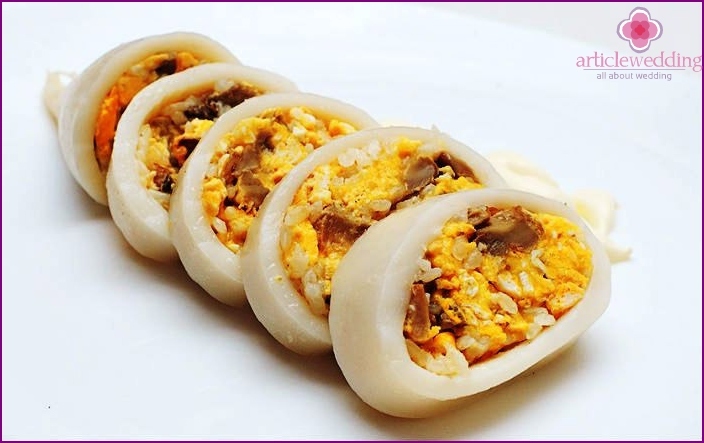 Complement the taste of squid products, such as eggs, cheese, shrimp as part of the filling. Appetizer of stuffed squid is relevant at any time of the year and will be a real decoration of wedding table. To prepare the filling must be chopped onions lightly fried in vegetable oil. Peeled, sliced ​​shrimp combine with onions and fry a little more. Cooked eggs grate, combine with shrimp and onions. Carcasses of squid stuff the stuffing, put in a baking dish, pour the cream and sprinkle with grated cheese. 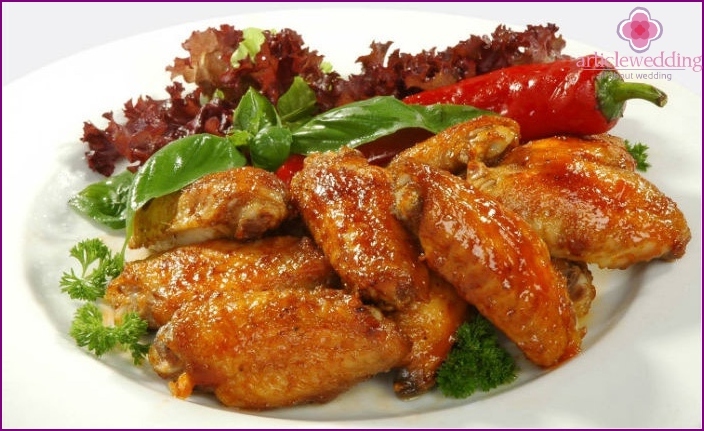 To prepare the required 10 minutes in an oven preheated to 250 degrees. Before serving, decorate with greenery. Serve the squid can be whole or cut into pieces. Tasty snacks for wedding table helporiginal issue chips. To create a culinary masterpiece you need a small amount of toppings to put on chips and garnish with greens. Options for filling can be very diverse: from crab sticks, chicken, seafood, caviar, fish. But the classic recipe for a cheese snack on chips, will surely enjoy all appreciated. Cut tomatoes into cubes, excess liquid (juice) to remove. Green chop, garlic clean, pass through spadefoot. Connect the cheese, tomatoes, greens, garlic and mayonnaise - mix. Stuffing put on the chips. It is important to remember - the filling should be put directly before serving snacks on the table as chips quickly soak. For guests with exquisite taste shouldprepare original dishes. 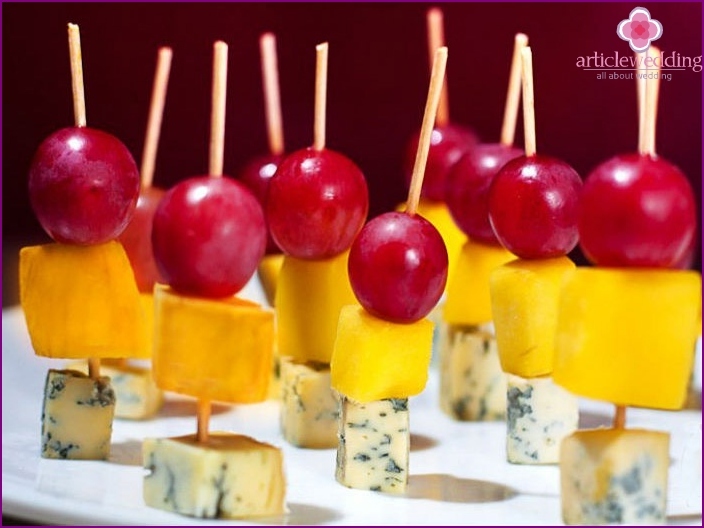 An example of such snacks for wedding table will serve as canapés with cheese Dor Blue. The combination of unusual tapas taste salty cheese dor blue, mango sweet and sour grapes will create a unique flavor. To prepare canapés need: mango, grapes (preferably without bones), cheese dor blue. Cheese, mango cut into slices. In the original recipe foods are cut into cubes, but in a desire to make possible different forms, using your imagination and a variety of molds. Skewer or toothpick is put grape, mango, and at the end cheese dor blue. Often, instead of using grapes or olives olives, pineapple and mango instead. 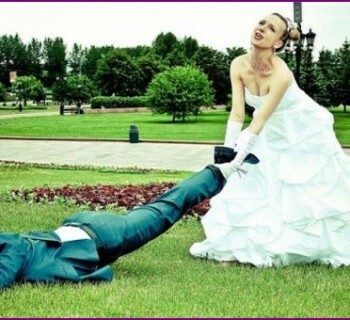 Wedding - happy holiday, which is unlikelypass without strong drinks. Alcohol should be a snack than a meat and warm, so hot meals on the holiday table are essential. Unlike standard dishes, hot meals are usually served already chopped, which eliminates the need to use a knife. Include hot menu not only snacks but main dishes. 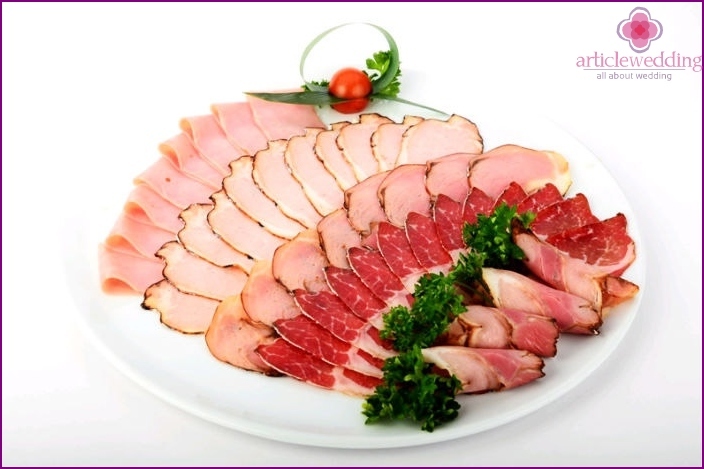 For example, the supply of whole roasted pig or duck stuffed cause incredible delight of the guests and everyone will want to try a piece of such dishes. 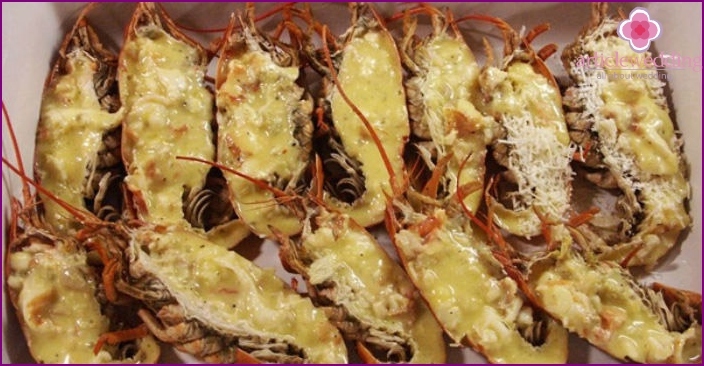 Unusual wedding hot snacks can beoriginal dish - crayfish in shells. The unique design and supply will surprise guests, it will be interesting to try a new dish, and the unique taste of the snacks they will be remembered long after the banquet. Thanks to the recipe of the original starters, everyone can prepare their own crawfish at home. to taste - salt, herbs. Rakov cook, neck and claws separated. From the shell, remove the insides, and then rinse them in salted water. It is necessary to pick up the shells of the same size, put them together so as to form an oval box (similar in appearance to the boat). Mushrooms fry until half, chop with a knife, fill with crayfish sauce. Connect peeled and chopped claws, neck and mushrooms. Fill with a mixture of shells. The shells lay on a plate, sprinkle with herbs. The dish is ready to be applied to the festive table. As a rule, used for cold tartletssnacks, but in some cases the baskets are indispensable for hot dishes. An example of a hot tasty snack for wedding table in a tartlet perch in tomato sauce. It is unlikely that such a fish appetizer leave anyone indifferent. How to properly prepare tartlets with perch and what ingredients are needed for this? The ground perch fillet, cook until half cooked, add the mushrooms. The broth is poured, and the capacity to add tomato sauce, boil. Put the mixture into the tartlets with puff pastry or. Decorate the tartlets before serving with greens and slices of crab. Rinse well with rice and boil in salted water. Boil until cooked until a crumbly rice porridge. Add 40 grams of butter. Crab oil chop, combine with rice. Add to the mix an egg yolk, spices. From stuffing to make the finished balls, breaded in flour, dip in egg white and then in breadcrumbs. For frying require a large amount of vegetable oil to croquettes were fried like fried. 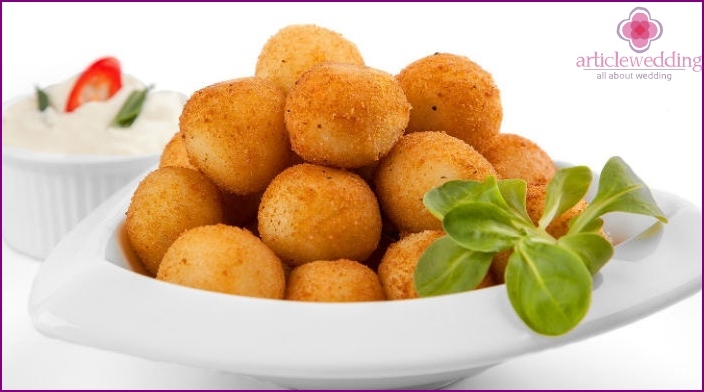 Ready-made croquettes with a piece of butter, put on a platter and sprinkle with herbs. Snack is ready for submission to the wedding table. How many servings of snacks must be a man? 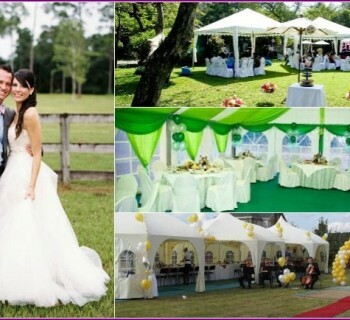 Calculate exact number of snacks thatyou need for a wedding holiday table, it is difficult, because each person has different taste preferences, appetite. Roughly calculate how many servings of food and better order, will help the administrator of the restaurant, which will be held a wedding banquet. For example, approximately the weight of a portion snack per person is approximately 50-70 grams. While training, you need to take care ofsnacks that will entertain guests after the redemption of the bride from her home (eg, small canapés or sandwiches). It should be borne in mind that the guests during a party actively eat the first 20-30 minutes, then drink more and use food as a snack. If after visiting the registrar was a long walk, it is likely that visitors are tired and hungry, so cold snacks are served at the beginning, to be eaten with pleasure.